Mouse-ear hawkweed is a perennial, native to all parts of Europe. Hawkweeds were introduced to North America for ornamental and medicinal purposes in the late 1800s. 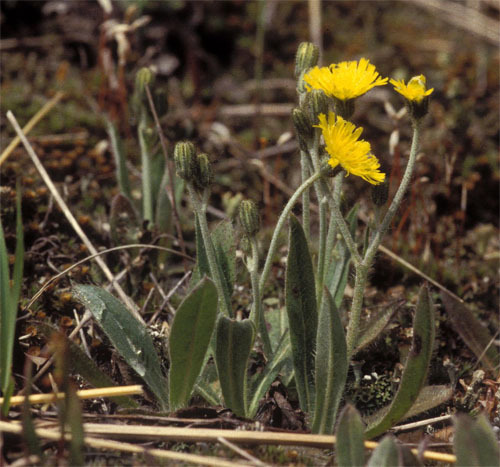 Mouse-ear hawkweed invades grassland and quickly forms dense mats of rosettes. It changes the soil chemistry by lowering the pH, which makes the habitat less suitable for native vegetation. Single flowers grow at the end of un-branched stems. The flowers are yellow and petals sometimes have red stripes on the underside. 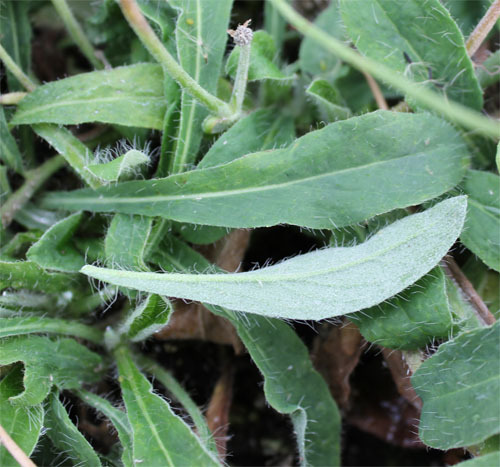 The plant has mainly basal leaves (at the bottom of the plant). The leaves are lance-shaped or spoon-shaped, blue-green on the top side and almost white on the underside, and have conspicuous long hairs. The stems are hairy and grow up to 40 cm tall.The plant usually has obvious light green to white stolons (also called runners - slender stems that grows along the ground, growing roots, and making new plants). It can also be confused with many yellow-flowered members of the Aster family of plants (composite flowers - like dandelions). Hairs are an important characteristic of non-native hawkweeds. 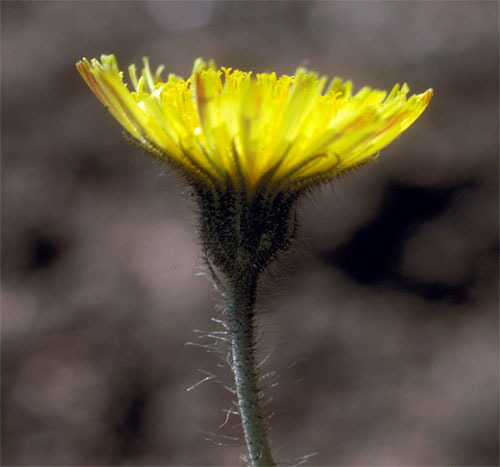 No native species of Hawkweed produces stolons.